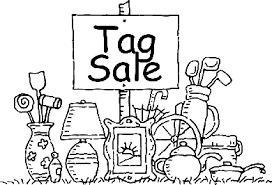 A COMMUNITY TAG SALE TO BENEFIT THE SANDISFIELD PLAYERS’ PERFORMANCE IN ENGLAND IN 2016! Mark your calendars, clean out the attic, the garage, and the shed and donate your stuff to support the Sandisfield Players for their trip to Cornwall to perform at the Minick Theatre. There will be food and fun and lots of things to buy that you really need, and some you never knew you needed until you see it that very day! Tag sales never fail to surprise and amaze.